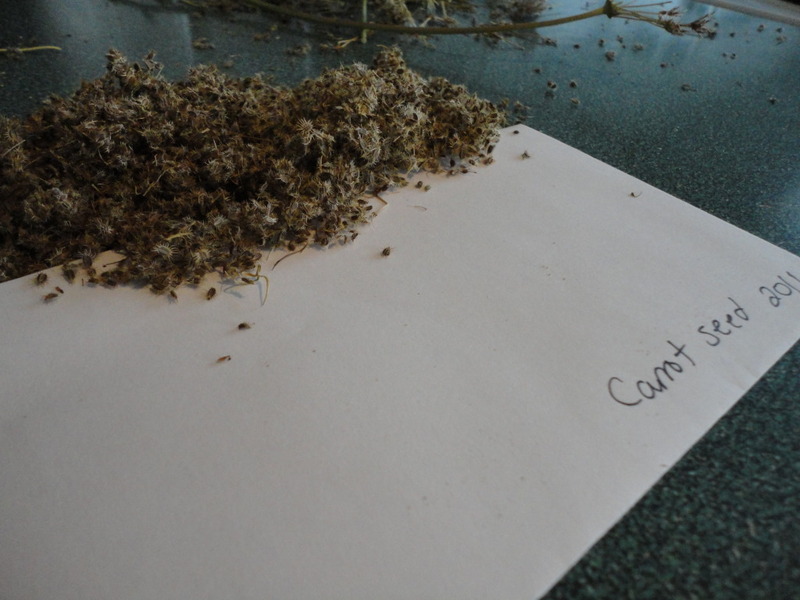 The final entry in my seed saving series is on herb seed saving. Allow the herbs to flower and go to seed. Wait until they start to dry on the plant, then cut off the portion of the plant with the flowers/seeds and hang to dry for a couple of weeks. The drier the plant, the easier the seeds will be to save. "The dill flowers produce a pod in which the dill seeds grow. 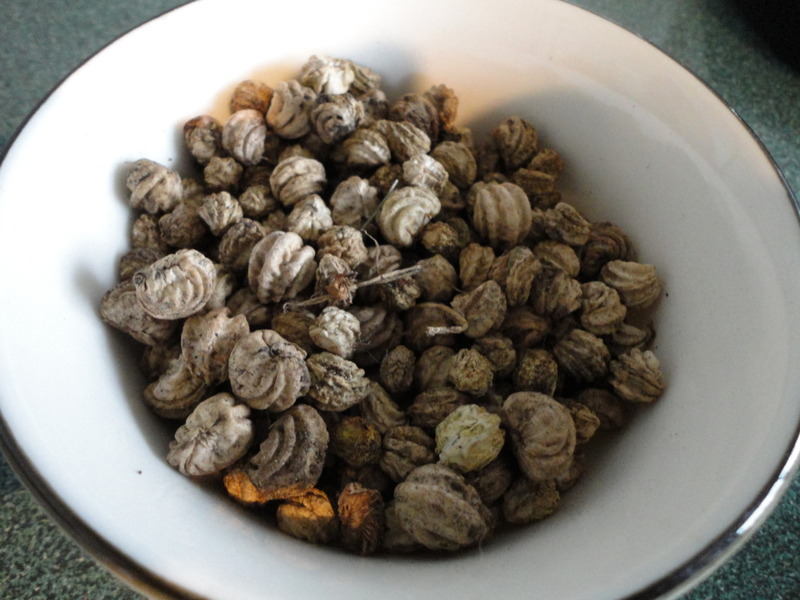 Collect these seeds as they turn brown and before the seed is scattered as the pods open." Cilantro seeds are just as easy as dill to save. Also known as coriandor, they too are easy to recognize because of their common use as a spice in food. Again, simply allow the plant to flower and produce seeds. Let the seeds begin to dry out on the plant and then cut them off the plant and hang them to dry for a couple weeks. Once the seeds are completely dried out, remove from the plant and store in an envelope, A bit more detail about saving coriandor seeds can be found at this website. The above image was taken from that website (thank-you!!). Finally basil seeds. These are not as easy. In fact, of all the seed saving I did this year, I would have to say that the basil seeds were the most difficult. Although the process is essentially the same (allow the plant to flower, let the flowers dry out, harvest and hang to dry for a couple of weeks), the extraction of the seeds from the flowers is time consuming and nit-picky work. Basil seeds are tiny and are found within the also tiny flower that the plant produces. You have to carefully extract the tiny seed from the tiny flower and then put the seeds carefully into an envelope for planting next year. It's worth it, of course, if you have a successful variety of basil that you would like to grow again next season, but it will take time and patience. And nimble fingers. Tools that might help with basil saving include a large tray and tweezers. The large tray will contain the seeds as you try to extract them from the flowers, and the tweezers will make it easier to pick them up. This year I saved Genovese (typical) Basil. Red Ruben Basil, and Cinnamon Basil. All plants grew easily and produced well, but as they got older (toward the six month mark) they got leggy and woody and tended to develop bugs. As a rule, I've found it's better to just try to keep a supply of young basil in the house, and use the older basil just for seed saving. Marigolds are easy to grow, cheerful, and attract positive insects - such as ladybugs - to your garden. To add to the list of benefits, it is also extremely easy to save their seeds for the next growing season. Marigold seeds were the only seeds I tried saving last year, and I had relative success with germination rates. The seeds I saved in envelopes in cool, dry storage had a germination rate of about 50% (which seems comparable to most store bought seeds I have planted). The seeds I put in the freezer, however, didn't work at all. Several sites I used during my research suggested this 'freezing method", but I would advise against it. While generally the rule with marigolds is to "deadhead" (remove) the blossoms as they die off, at the end of the season it is a good idea to let a few of the blossoms dry out on the plants. After they are fairly crunchy, remove the flower and store in a dry location for another few weeks. Once the flower is thoroughly dried out, remove the stem portion from the petals and you will see hundreds of seeds ready for the plucking . These can be put into an envelope, labeled, and stored for the next year's growing season. Easy as pie. Next up, the last entry on seed saving, all about herbs. Basil, cilantro, and dill. Beans are easy to grow and it's just as easy to save their seeds. I saved both vine and bush beans this year, but the process is the same. Simply allow the pods to dry out on the vine before picking. Once they have dried out, pick the pods and store them in a cool, dry place to dry out further. I let mine dry for about a month in my corner cupboard before shucking the bean pods. 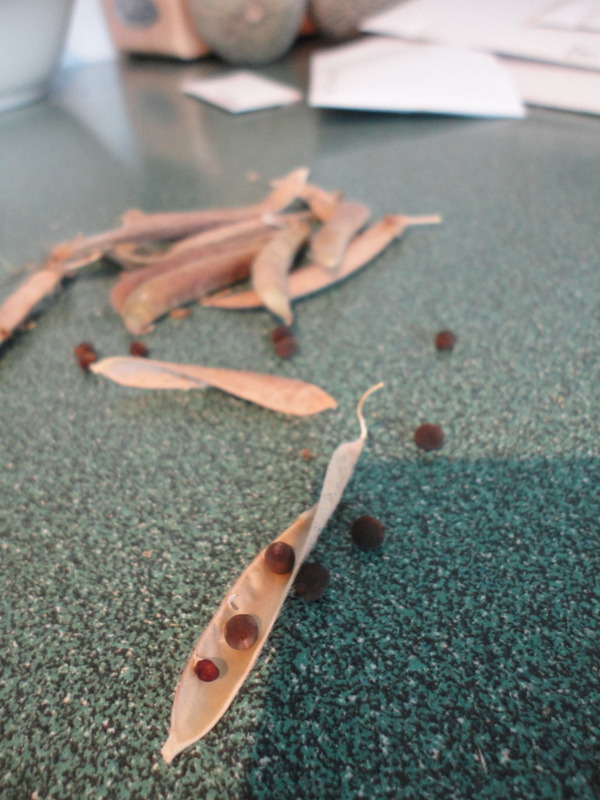 After they are fully dried out, just take the bean seeds out of the pods and save them in an envelope for next year. Easy as pie! Just make sure that you label the different kinds of bean properly, as bush beans and vine beans don't make very good growing companions. Some planting tips for next year - soak your bean seeds for 24 hours before planting and direct seed in the garden as early as mid-May on the coast. Beans can be succession planted throughout the season into July to be harvested all season, and some varieties have plants that will produce for long periods - I've picked beans off of some plants for weeks. 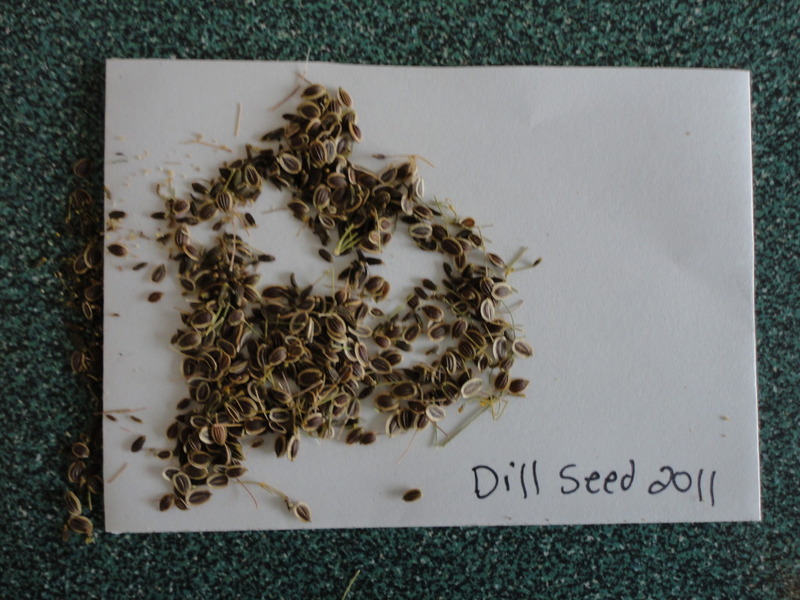 I've noticed that other varieties only get a single harvest, however, so it's good to make note of these differences when saving seeds in the fall. My favourite smell in the entire world is the scent of a sweet pea blossom. It goes without saying, then, that these delicate flowers can be found in my garden every year. Another wonderful thing about sweet peas is how easy their seeds are to save! Much like peas and beans, all you have to do is let the little pods that develop dry out on the vine, pluck'em off, and save them in an envelope for next year's planting season. They will turn a brownish colour and the pod itself will become papery and brittle. They are easy enough to "shuck"; and the seeds are large and easy to handle (much nicer than the carrot seeds, or the basil seeds that will be mentioned in an upcoming entry). As you can see, saving sweet pea seeds is easy! I'll let you know next spring what the germination rate is. Have any of you tried seed saving in the past? What has worked? What hasn't? I'd love to hear your comments! Saving nasturtium seeds is extremely easy, and one large nasturtium plant can yield hundreds of seeds for you to plant the next year. This is a good thing, as I have found my general germination rate (for store bought seeds, anyway) to be around 50% for nasturtiums. Picture of what the nasturtium seeds should look like when you "harvest." Nasturtium seeds are pods that grow on the plant after the flower has matured and died off. As the pods age, they begin to dry out and eventually fall from the plant and onto the soil. As this happens, all you need to do is collect the pods from the ground and save them in a dry space until they are completely dried out (this prevents moulding in storage). My seeds, drying out before I packaged them. Once they are completely dry, pack them in an envelope and label them, and you are all ready to grow more beautiful flowers next season. If you have several varieties be sure to keep the seeds separate and label them accordingly, unless you are like me and like to get a surprise once in awhile when you plant. Another suggestion is that you can try to get them to "self sow" by simply pressing the seeds into the ground instead of collecting them. If you are going for a wilder look to your flower bed it would definitely be worth a try. ~So after posting this article I realized that I may have missed a step in the seed saving process. None of the articles I read online were very clear about this, but as I was packing up seeds for a friend I noticed that the store bought nasturtium seeds that I have looked a lot smaller than the pods I have saved off of my own plants. Since the seeds were a lot drier now than they were a month ago, it was relatively easy to get the outer shell off and reveal the smaller, smoother seed within. I'm not sure if this is necessary, however. Several of the seeds that I had just left in my plot had already begun to sprout , even though the outer covering had been left on. However, just to be sure I sent my friend the seeds without the coating, the same as the commercial seedsI had purchased earlier in the spring. One of my projects for this year is to start saving my own seeds. For a quick overview on seed saving, check out this extremely informative website. Nasturtiums, beans (bush and vine), sweet peas, cucumbers, dill, coriander (cilantro), basil, carrot, and, once again, marigolds. This will be a multi-part entry, as I want to go into a bit of depth about how each type of seed is saved. First, let's talk about carrot seeds, as they take a couple of years to harvest. Carrots have a two year life cycle. The first year is when we get that delicious, edible root. If, however, instead of harvesting that root you allow your carrot to stay in the ground and continue to grow, the next year you will get a beautiful, flowering carrot bush. These flowers, as they age and dry out, produce thousands of carrot seeds from a single carrot left in the ground over the winter. If you live in a colder climate where your carrot may not survive the winter, you could always try bringing it inside for the coldest months and replanting, or putting it in a cold frame or greenhouse until the worst of the winter months are over. There are more detailed instructions found at this site. I found that on the west coast my carrot bush continued to grow over the winter, not minding the occasional snowfall or harsh frost. I also only left one in, which ended up being a good decision as the carrot ended up taking up a considerable amount of room in its second summer of life. After the carrot bush had flowered, producing beautiful white, sweet smelling blossoms, I allowed the flowers to age and brown on the plant. Allowing the seeds to dry naturally as much as possible on the plant is advisable for all types of seeds. This ensures that the seed is as ready for germination as possible, and helps to prevent mould from developing. Once the flowers were browned and the seeds almost ready to fly off on their own, I removed the flower heads and stored them in a dry, dark place for a few weeks to ensure that they had dried completely. Following this, I removed the individual seeds from the flower stalk and saved them in a labeled paper envelope so that I can plant them next spring.